Join our sister neighborhood association at the ADMNA Festival Saturday from noon-5:00. This is a positive compared to the crimes reported in the next 3 articles. Read about a former DMNA president who died this week. Learn how to participate in the City of Madison’s budget process and how to be sure you have your voter ID for the next election. Unless noted otherwise, the articles were written by Mary Mullen. - Fri., August 5, 5 p.m.-dark - Annual DMNA potluck picnic, Marlborough Park basketball court. Bring a potluck dish to share, anything you want to grill, your own beverages, picnic-ware, and a lawn chair or blanket to sit on. This is a low-key, friendly gathering for all people in the neighborhood. 15 - Free Voter ID card Requires $20 Fee for Birth Certificate! 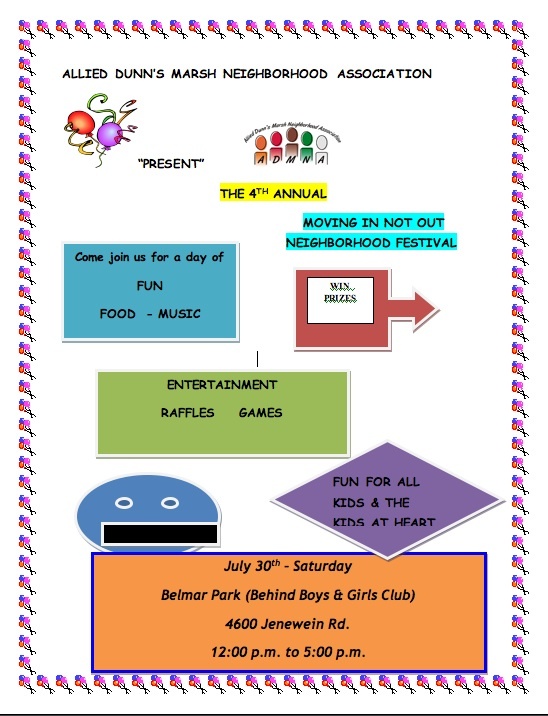 The 4th annual “Moving In Not Out Neighborhood Festival,” sponsored by the Allied Dunn’s Marsh Neighborhood Association starts at noon this Saturday, July 30, at Belmar Park (behind the Boys & Girls Club). Weather permitting, it will continue until 5 p.m.
Fun, food, music, raffles, and games are planned. It’s a good place to meet socialize or just kick back and be a people-watcher. Also, remember that the Dunn’s Marsh Neighborhood Association will be having its annual potluck picnic on the east side of the neighborhood in Marlborough Park on the following Friday, 5 p.m. until dark. Four years ago, on the night of October 13, arsonists burned the Marlborough Park playground, setting in motion construction of a bigger, better playground. The arsonists were never found. It seems that now some firebugs are at it again. Can you believe that in the past week, in broad daylight 3 young people were actually seen starting a fire in one of the hay-mulched gardens in the Marlborough Community garden and setting it afire? Sadly, that is true. Two gardeners were in their plots in the no-till garden and saw the culprits. The arsonists were 2 older teenage boys and a younger girl. When one gardener yelled at them, they fled, carrying a gas can. That gardener grabbed a hose and put out the fire, limiting the damage. The vandalism was reported to police, but as yet these misguided young people haven’t been identified. There are also reports that someone has tried starting fires at the back door of the Boys and Girls Club. Another person saw kids trying to set a fire in the trash barrel near the basketball court in Marlborough Park and stopped them. Call 911 if you see arson in progress. Lots of police cars and a civilian car with an open door were what caught my attention about 12:45 this afternoon when I passed by Zimmer’s Liquor Store at 4217 West Beltline Highway - the frontage road. A call to Mr. Zimmer revealed that the problem didn’t really involve either his place of business or an accident. Apparently, a stabbing had taken place shortly before elsewhere in the neighborhood, and the police had been lying in wait in front of his establishment for the car to pull up. Both the perpetrator and victim were apprehended there. “I got to watch the whole thing for about an hour,” he said. As a subscriber to the Meadowood Neighborhood e-mail list, I’ve learned recently that that neighborhood along Raymond Road has been experiencing a lot of small crime issues. Here’s what their association is recommending. Since this is also what we in the Dunn’s Marsh neighborhood need to do, I’m reprinting it. Since I sent out emails about recent criminal activity in the [Meadowood] neighborhood I was alerted to mailboxes being damaged on Monticello Way, someone's vehicle being keyed on Prairie Road and an attempted motorcycle theft. These are just a few ways neighbors can keep city officials and neighbors informed! Felipe Avila and I wanted to let you all know that Iverson Construction has reached Substantial Completion on the Apache Drive Wet Pond Construction Project and we'll be having a final punch list walk-through with them early next week. Please feel free to pass along any comments, concerns, and/or suggestions to me or Felipe at your earliest convenience so we can address these prior to final payment. 2. September or October 2011 - Public Grand Opening Celebration of the Apache Drive Pond and Volunteer Planting Party with neighbors, DMNA, ADMNA, Dane County Boys and Girls Club, Boy Scouts, Girl Scouts, and/or any other interested service organizations. This would include a summary of historical development patterns of the area, reasons for the pond construction, future management of the pond (e.g. mowing, prescribed burns, etc. ), potential future connections to the Cannonball Path, and informational signage. Also, we've had some requests to install pet waste signage, bag dispensers, and receptacles as well as picnic tables and/or benches. If anyone has comments, concerns, and/or suggestions on any of these items, please feel free to let me know. Thank you everyone for the positive feedback you've given to me and Felipe so far! Let's keep those ideas and suggestions rolling in. He was a quiet neighbor but one with a passion for volunteer activities. Charles Billings, of Windflower Way, was known best in upper-echelon soccer, but he also devoted some of his time to the Dunn’s Marsh Neighborhood. Read about his contributions to the Dunn’s Marsh Neighborhood here. The link to his soccer activities as a player and as an adult leader here in Madison is at the end of this article. Charles Billings became a DMNA Council member in October 1989 and served as Secretary until the fall of 1991 when he moved up to Vice President. In May of 1992 he became President of the DMNA and continued in that position through October 1993. There’s a gap in my set of newsletters between October 1993 and April 1994, but apparently at the fall 1993 meeting, a new president was elected, and Charles became Vice President. October 1994 brought a new change of duties. Charles was again Secretary and remained so until the September 1995 annual meeting. That’s a total of 6 years continuous service on the DMNA Council, nothing to sneeze at. Charles did not serve on the Council again, but he did help the DMNA come out of its “quiet period” of the early 2000s. He was one of 9 people attending what my notes of that October 1, 2005 meeting call the “Neighborhood Assoc. Resurrection Mtg.” Also attending were other former DMNA presidents Dave Martin, Scot Sauer, and Mary Mullen, and former Council members Carol Poole and Sharon Flinn, as well as Dave’s wife Linda, and newcomers Danielle and Ray Rosales. At that time, as we went around the circle, Charles spoke in favor of coming alive again. He saw our role as one of collecting and disseminating information, serving as a “hub of information” and pulling that information together. He also mentioned that we should revive the spring cleanup and should sponsor social activities. Personally, he said that he wanted to get to know newer residents and develop friendships. Later in the meeting he also mentioned that the neighborhood needs “the leverage of an association.” Individuals alone can’t do as much as residents working together in an organized group. Charles also attended a meeting of most of the same people on October 24, 2005 as we planned how to proceed toward rejuvenation. Finally, he was one of the people that helped lead the public meeting in April 24, 2006, that officially got the DMNA going again with election of a new slate of officers. Charles em-ceed the all-important part of the meeting where people aired their concerns and ideas. And, as they say, the rest is history. We’ve been a going operation ever since then, and we’ve made a difference. Let’s not leave thinking about Charles Billings without a few wise words from him about being part of the neighborhood association. His words are just as true today as when he wrote them nearly 18 years ago. Writing in the Dunn’s Marsh Neighborhood News in October 1993, he urged neighbors to become more involved in the Association. The future of the DMNA is a fragile thing. Like all functioning organisms, its future is dependent on a periodical infusion of new resources to replace those that are lost…. The issues the DMNA address do directly affect the neighborhood’s residents. We need and want persons who are interested in the local problems and concerns. Persons who want to be able to affect local events; to bring about change; to find out what’s going on. The DMNA is the locally based vehicle to achieve these goals. Join us for your own benefit - for our mutual benefit. Didn't know him too well kept to himself and had others doing his yard work. Hard to see a long time resident pass away this way. I’ll add that I’ll miss Charles too even though I only talked to him when I delivered flyers on his street. He was always friendly and supportive. In the last conversation I had with him, probably a year ago or so, he talked about his work with soccer. He was obviously proud of his work there and very busy with it. Ready to comment on the Verona Road Final Environmental Impact Statement (FEIS)? In hardcopy, provide your comments to Joe Olson, Regional Director, WisDOT, SW Region, 2101 Wright St., Madison, WI 53704-2583. If you have little time, at least study the Executive Summary which is at the beginning of Volume 1. It’s about 25 pages long. The proposed Verona Road/West Beltline project Final Environmental Impact Statement (FEIS) is out. It has many plans for bike/ped facilities in the vicinity of Verona Road and the Beltline. Written comments must be in by Monday, August 15. There will be no public hearing. crossings involving the Southwest Commuter Trail, the Badger State Trail, and the Cannonball Trail, especially of Verona Road and also PD, and in Stage 3 as well as Stage 1 and 2. Some of these crossings are a veritable nightmare now. The at-grade crossing of the Beltline on Verona Road is extremely dangerous now. A proposed tunnel that will connect the Beltline frontage roads on each side of Verona Road is a big improvement over the at-grade crossing – 17 lanes after Verona Road expansion!!! - that was proposed in the Supplemental Draft Environmental Impact Statement. The Badger Trail and Cannonball crossings of PD are at grade right now. 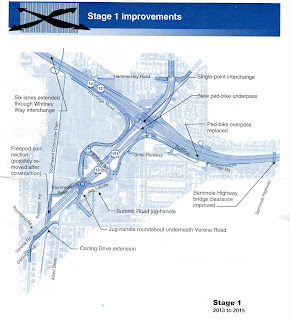 Plans for Stage 1 – coming up in 2012 – do NOT provide for grade separation. Traffic on PD is heavy now and travels fast, making it dangerous to cross. Traffic will only get much, much worse during the 3-year construction period when traffic will try to avoid going through the construction zone up by the Beltline. A grade-separated crossing is still not promised for Stage 3, around 2030. Changes to the access point to cross the Beltline on the ped/bike bridge at Whenona Drive are counter productive in my view since few bikers and even fewer pedestrians – often school kids going to Cherokee or Thoreau – like going half a block out of their way in the wrong direction and then having to double back toward their point of origin. Now the access point for the ped/bike overpass is at Whenona Drive. Today’s users don’t need to cross traffic either on Whenona or anywhere else when getting on from Whenona. The newly proposed access point would mean that many peds and bikers would have to cross Whenona and/or Britta, go half a block west, then come back half a block east to get on Whenona and go down to the schools. People heading to Dorn Hardware, including myself, would probably chose to risk the at-grade crossing of the Beltline on Verona Road rather than go the extra block and then have to cross Verona Road/Midvale at-grade anyway even though they had already taken the overpass. 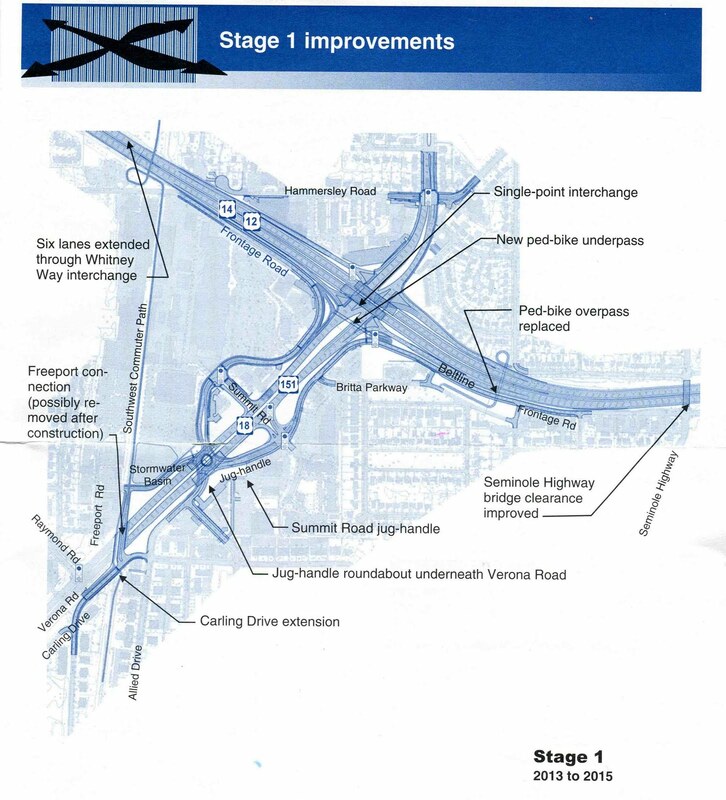 The Stage 1 plans calls for moving the Southwest Commuter path to the west at the underpass of Verona Road. Stage 3 offers a couple of choices – keeping it more or less on its same alignment or putting it on a Raymond Road bridge. I go for the straight shot myself. This summer WISPIRG Energy Service Corps ‘Power to the People’ campaign is working to increase energy efficiency in Wisconsin. The Energy Service Corps is working with homeowners to make their homes more energy efficient. WISPIRG's Energy Service Corps is a joint project of the WISPIRG Foundation and AmeriCorps. Specifically, AmeriCorps members with WISPIRG Energy Service Corps will provide FREE home energy assessments and upgrades. AmeriCorps emphasizes community service. It’s somewhat like a domestic Peace Corps, I believe. AmeriCorps members receive a modest living allowance, student-loan forbearance, health coverage, and child care for those who qualify. After successfully completing their term of service, they receive an AmeriCorps Education Award of up to $5,350. This award can be used to pay off qualified student loans or to finance college, graduate school, or vocational training at eligible institutions. The City of Madison is urging people to protect themselves from the dangerous heat and humidity. Temperatures have been in the mid-90s recently with heat indexes of up to 115 degrees. Although it’s cooled off somewhat this week, you still might want to put the following information in your memory bank. The ones closest to us are the public library branches at the Meadowridge Library 5740 Raymond Road and Sequoya Library at Midvale and Tokay. The Cypress Spray Park at 902 Magnolia Lane and the Goodman Pool on 325 Olin Avenue are other facilities that can cool a person down. Check out the website for information, facilities and map of cooling centers. City of Madison residents are invited to participate in an on-line survey about the Madison Budget. Each year during the budget process, we ask Madison residents for their thoughts as to how the city should spend its money. This year, as you think about the upcoming city budget, please go deeper than individual line items – consider what values are important for our city and how these values should be expressed in the services that the city provides for individuals, neighborhoods and the city as a whole. Elected officials and city staff will attend, as you discuss with your neighbors your values and priorities for city services, keeping in mind how this budget will affect you, your neighborhood, and your city. This meeting covered (1) the Community Development Authority (CDA) and the (2) Community Development Division. Departments & Division covered are Common Council, Mayor, Municipal Court, Civil Rights, Attorney, Assessor, Clerk, Treasurer, Finance (Comptroller), Information Technology including City Channel, and Human Resources. Committees & Commissions covered include Affirmative Action Commission, Equal Opportunities Commission, Commission on People with Disabilities, Personnel Board, and CCOC. This meeting will cover the following Departments and Divisions: Public Works, Engineering, Streets, Traffic Engineering, Metro Transit, Planning Division, Economic Development Division, Building Inspection, and Water. Committees & Commissions covered by the Infrastructure meeting are: Madison Arts Commission, Downtown Coordinating Committee, Long Range Transportation Planning Committee, Ped/Bike/Motor Vehicle Commission, Board of Public Works, Committee on the Environment, Solid Waste Advisory Committee, Vending Oversight Committee, Plan Commission, Urban Design Commission, and the Landmarks Commission. This meeting will cover the following Departments and Divisions: Library, Monona Terrace, Overture Center, and Parks. Departments & Divisions covered will be Fire, Police, and Public Health. The Committees and Comissions included are: Public Safety Review Committee,Board of Health for Madison & Dane County. and the ALRC (Alcohol Licence Review Committee. Beginning in September, the City Clerk’s Office will offer presentations and question & answer sessions throughout the community to educate voters on the requirements of the new voter ID law and on how to obtain a free ID for voting purposes. Information on the new law is available at http://www.cityofmadison.com/clerk/PhotoIDDetails.cfm <http://www.cityofmadison.com/clerk/PhotoIDDetails.cfm> . It is also printed below. Thank you for helping us spread the word about these extensive changes to our voting process! The new voter ID law passed by the State of Wisconsin and signed by the Governor provides that voters may receive a free identification card for voting purposes. However, there’s a BIG catch. To get a free ID, voters born in Wisconsin will need to present a certified birth certificate to the Department of Motor Vehicles. The certified birth certificate costs $20! Besides the money, to get the certified birth certificate, you will have to also provide some kind of identification that you are who you say you are. It used to be that you could simply provide this kind of information when you registered to vote right at your voting place on the day of the election or prior to election day at your municipal clerk’s office. There was no need to have a birth certificate and no fee at all for registering at the polls or at the clerk’s office. Now voters must go to a Motor Vehicle Department office with their materials in order to get ID if they don’t already have it. Fortunately, if you have a valid Wisconsin driver’s license, a passport, or military ID, those will work at the polls as ID although you still have to prove your address if your ID doesn’t have your current address. Would-be voters born in other states have various requirements to get their certified birth certificates. For example, people born in Illinois must pay $15 for a full certified birth certificate and also pay an $8.50 fee to apply for the certificate if using a credit card. If you were born in Iowa, the fee is $15 and another $9 for using a credit card to order it. It might take weeks to get your birth certificate too. The Iowa information notes that it might take 30-45 days to get the birth certificate ordered by mail or 10--14 days if you ordered by telephone using a credit card. Or if you went to Des Moines, IA to get your birth certificate in person, you would have to come back 1 or 2 days later to get it after you ordered it. Of course for other states there are often other requirements as well such as filling out an application form, providing photo ID, and method of payment. For comparison to the “free” Voter ID, the cost of a driver’s license or Wisconsin voter ID is at least $28 - and up to $35. This might make it somewhat cheaper to get a free Voter ID even if you have do have to pay $20 for a certified birth certificate. But, regardless of that, the new Voter ID law has made it quite a bit harder to register to vote. Photo identification used for the purpose of voting is not required to have a current address. - Under the new law, you may no longer register to vote the Saturday, Sunday, or Monday before an election. However, you may still register to vote at your polling place on Election Day. - Voters may no longer use a corroborating witness as proof of residence when registering to vote. Acceptable forms of proof of residence - http://www.cityofmadison.com/election/voter/voterRegister.cfm <http://www.cityofmadison.com/election/voter/voterRegister.cfm> . Voters are now required to sign or make their mark on the poll book before receiving a ballot. There is an exemption for voters who are unable to sign the poll book due to a disability. This change is effective immediately. There are no immediate changes to absentee voting, but the following changes will be implemented in 2012. Photo ID must accompany absentee ballot requests. Voters will be required to send a photocopy of an acceptable form of photo identification with their absentee requests. There are exemptions for indefinitely confined voters on the permanent absentee list, military voters, voters who are permanently overseas, and voters in nursing homes who are receiving their ballots from special voting deputies. Photo ID enclosed with absentee ballots. Voters may be required to enclose another photocopy of their acceptable form of photo identification in the envelope containing their voted absentee ballot. We are waiting for the Government Accountability Board to provide some guidance on this requirement. There are exemptions for indefinitely confined voters on the permanent absentee list, military voters, voters who are permanently overseas, and voters in nursing homes who are receiving their ballots from special voting deputies. Absentee voting in the Clerk’s Office ends the Friday before the election. The City of Madison has traditionally been open for voting the Saturday before each election, but will no longer be able to offer this service in order to comply with the new state law. Beginning in 2012, voters who do not present an acceptable form of photo identification will be given a provisional ballot. This ballot will not be counted unless the voter returns to the Clerk’s Office with acceptable photo identification by 4 p.m. the Friday after the election. The voter photo identification law eliminates straight party voting for everyone but military voters and voters who are permanently overseas. The Clerk’s Office will hold voter education sessions throughout the community to answer questions about these changes in state law. If you would like someone to speak to your group, please contact us at clerk@cityofmadison.com <mailto:clerk@cityofmadison.com> or 608-266-4601. We ask that you help us spread the word about these new regulations. Our goal is for all eligible voters to be able to cast a ballot and have that ballot counted. 1 - DMNA Potluck Picnic, August 5, 5 p.m.
After skipping a year, the Dunn’s Marsh Neighborhood Association (DMNA) is on track for holding its annual potluck picnic in Marlborough Park, on Friday, August 5, from 5 pm until dark. Don’t miss it! It’s a friendly, low-key event to which people from the entire neighborhood are invited to show up and meet neighbors. The neighborhood is bounded by Verona Road and the Beltline, Seminole Highway, Dunn’s Marsh, and Allied/Carling Drives. This is an event for long-time and new residents. In fact it’s a great opportunity for people new to the neighborhood to get to know their neighbors. Bring the kids, your partner, grandma, the next door neighbors, and any other friends who happen to be visiting you. Also bring a potluck dish to share, your own beverages, items to grill, tableware, and a lawn chair or blanket to sit on. If you have some outdoor games for kids, they would be welcome too. The DMNA will provide friendly, down-to-earth people, the grills with hot coals, tiki torches for “atmosphere,” horseshoes so you can try out our state of the art horseshoe pits, and a few entertainments for kids. If the weather is good, the picnic will be on the basketball court on the east side of the park near the kids’ playground. If it’s rainy, we’ll be in the shelter in the middle of the park. 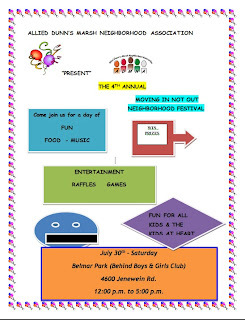 Our sister neighborhood association, the Allied Dunn’s Marsh Neighborhood Association (ADMNA), has scheduled its festival for Saturday, July 31, from 12 noon until 5 pm at Belmar Park, 4600 Jenewein Road. A tentative budget estimates the festival will cost about $3,000. Costs are for bounce rides, an obstacle course, generators, tents, set up and breakdown expenses, food, port-a-potties, folding chairs, sound permits and closing of Jenewein. Organizations and individuals may wish to donate. “Help us to help the children of Allied have a festival they can be proud of and remember for years to come,” she concludes. 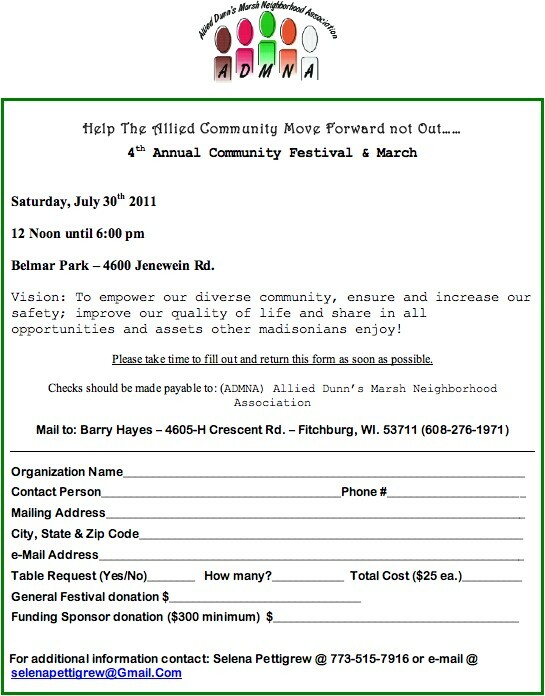 Donations can be made to the Allied Dunn’s Marsh Neighborhood Association and sent to Barry Hayes, 4605-H Crescent Rd., Fitchburg, WI 53711. 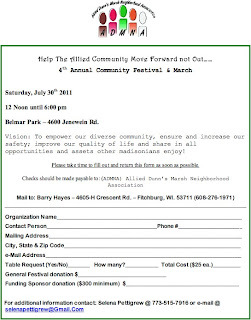 General donations of any size and from anyone are welcome, but organizations wishing to have an information table at the festival are asked to give $25 per table, and the “Funding Sponsor Donation” is $300 minimum. Donors should fill out the attachment “1 ADMNA donation sheet..jpg” and send it in to the address on the form. A big box arrived at my door on Monday, July 11. It was 2 copies of the FINAL ENVIRONMENTAL IMPACT STATEMENT and FINAL Section 4(f) Determination for the Verona Road project. These copies are for the use of the neighborhood. The Verona Road project includes adding lanes to Verona Road and the Beltline, changing access across Verona Road, wiping out the Beltline frontage road businesses between Verona Road and Whenona Drive, taking some residences, and many other modifications to the street patterns. Comments on the statement are due August 15. Only written or e-mail statements will be accepted. There will be no public hearings on this document. E-mail responses can be directed to Larry Barta at Larry.Barta@dot.wi.gov. Questions can also be referred to Larry at (608)246-3884. Although the complete FEIS is 3 ½ inches thick and weighs about 5 pounds, the 24-page Executive Statement at the beginning of Volume 1 gives a nice overview. The overvew is attached. Please take the opportunity to read and study it. The quality of the cover page is miserable, but all the rest is fine. The Verona Road FEIS is available to read in many libraries around the area and also online. Neighbors are urged to join the DMNA committee that will be developing a response to the Verona Road Final Environmental Impact Statement from the neighborhood association. Interested residents should call or forward their contact information to Kim Zinski, 608-271-2436, kimzinski@gmail.com. 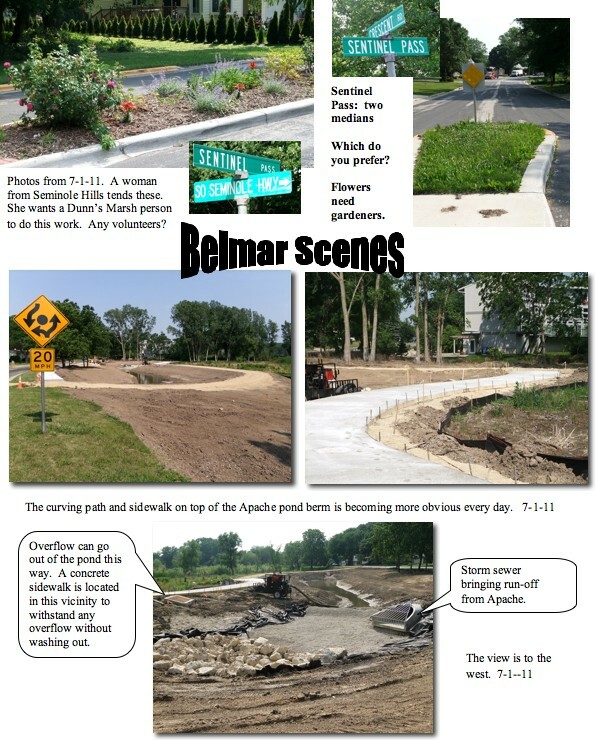 We’re getting close to finishing up the Apache Drive Pond project and are in the process of scheduling a special Grand Opening event either in July or August as well as a "rain garden and wet pond edge" planting party with the Boys and Girls Club and any interested, available residents from the Allied and Dunn's Marsh Neighborhood area. Joining the planting party is a super way to learn about rain gardens and about the other plants that grow well in wet areas. If you want to be a part of the planting party, contact Fitchburg’s Environmental Engineer Rick Eilertson. Check out the attachment for July 1 images of the pond area. 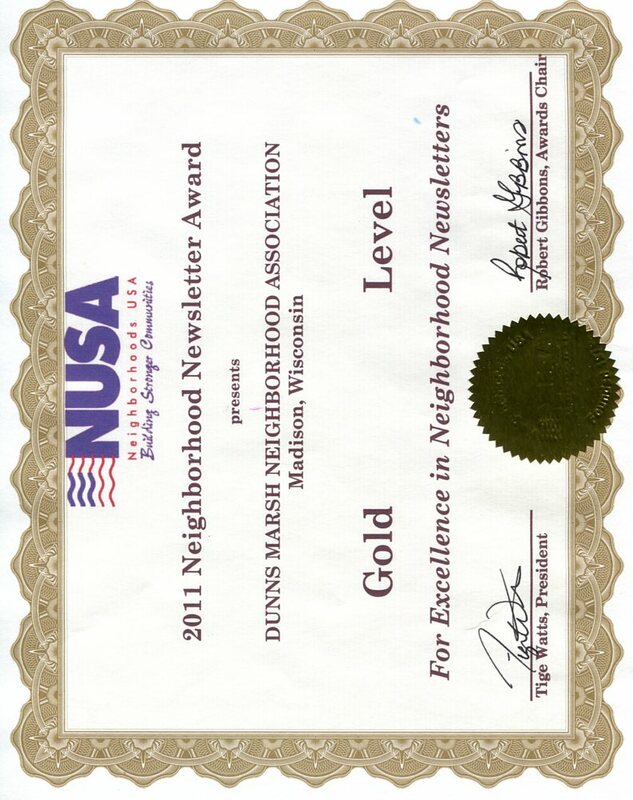 “You and your organization are to be congratulated on your newsletter and its goal to inform your residents of what’s going on in your community.” Those words came in a letter from Neighborhoods USA (NUSA), which announced that the Dunn’s Marsh Neighborhood e-News has won a Gold Level award for excellence in neighborhood newsletters. The 2011 newsletter award was made by Neighborhoods USA at the recent Neighborhoods, USA Conference in Anchorage, Alaska. It was based on submission of an application which included 2 consecutive issues of the e-News from the 2010 calendar year. The February 3 and February 12, 2010 issues were submitted. While the average size of the e-News is about 10 pages not counting attachments, the 2 issues submitted represent variations from the average. The February 3 issue consisted of 20 text pages and 4 pages of attachments. The February 12 issue was 3 pages long and had one attachment. There were a total of 38 entries in this year’s Newsletter Competition, 11 entries in the electronic category and 27 in the printed category. The Newsletter competition was not set up to pick one winner; it was designated to evaluate each newsletter entered against a set of criteria and present awards based on each entrant’s merits. Each entry was evaluated against the same set of criteria and based on its total scare earned either a gold, sliver, or bronze level award. The criteria included layout, consistency, content, relevance, and overall appearance. 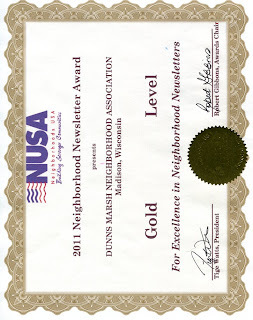 The Dunn’s Marsh Neighborhood Association was in the company of 5 other gold level winners in the electronic category. They include the cities of Phoenix, AZ and Arlington, TX, neighborhood associations in Pasadena, CA, and Portland, OR, as well as the East Madison (WI) Community Center. Three other organizations received silver level awards and 2 received bronze awards. I want to thank all of you for spreading the word about Piper. She has been found and is safe at home snoring away as I type this. I want to thank all of the citizens of Fitchburg from the bottom of my heart. I loved the people of your community already, but the support for the search for Piper has been overwhelming. Please feel free to call for details at 843-5757. The tiger kitten making the rounds of the neighborhood brought several responses. Two other people besides Kent Seeker had seen this kitten, and a third made an offer to adopt it if it is still available. The less than good news - perhaps - is that the kitten hasn’t been seen since the offer of adoption. Maybe someone gave it a home. June was an activity-filled month for the Dunn’s Marsh Neighborhood Association. On Saturday, June 11, a number of families held garage sales, and two Saturdays later a dozen people participated in the Yard and Garden Walk. Garage sale day, unfortunately threatened rain, holding down the number of customers. However, it did allow participants the opportunity to donate unsold items to Goodwill and thus get them out of the house. There’s definite value in that beyond the tax deduction. There were several highlights of the Yard and Garden tour which was attended by folks from a few months old up into the 80s. First of all, the day was sunny and not overly hot. Besides the nice weather and exercise, participants also got the benefit of learning in depth about some plants thanks to Dr. Galen Smith, a botany professor and member of Prairie UU Society where the tour began. Later, Donna Sarafin and Susan Kilmer explained how they are turning their back yard into a sustainable and edible landscape. We were lucky to benefit from Susan’s knowledge. She manages the Arboretum’s native plant garden. Next, the tour participants had a chance to admire a number of well-managed and pretty yards on Windflower Way. At the end, when only 4 hardy people were left, Ron Johnson gave a nice presentation about his wooded yard that had been designed by a former member of the DMNA, Steve Christy. Ron described his management style as “benign neglect.” Nevertheless, the design qualities were quite visible, and it was pleasant to be in the shade at noon while we looked at the plans developed by Steve and enjoyed the rocks that had been added to the yard in the past couple of years. Finally, the last 2 of us walked back to the east side of the neighborhood through Marlborough Park. The prize was getting a number of free plants from Dorothy Krause’s garden. Believe it or not, it’s a woman from Seminole Hills - not our neighborhood - who has used her green thumb to beautify the median at Sentinel Pass where it comes out on Seminole. That median, with its pretty pink roses, bright orange lilies, light green foliaged bleeding heart, and lavender spires of a plant I don’t know, will gladden the eye of any passerby. Why did someone who doesn’t even live in the neighborhood plant and tend “our” median? Well, she says, as a regular user of Seminole Highway, she wanted to see something beautiful every time she passed by. Our Seminole Hills benefactor would prefer that a Dunn’s Marsh resident take over the job of maintaining this little spot of color now that she has it thriving. If you think you might consider being the gardener of this pocket flower garden, contact Mary Mullen mmullen@chorus.net or 298-0843. She’ll refer you to the current gardener who will be glad to give you tips on what needs to be done (not too much). See the attachment “col Belmar pics.jpg” for the contrast between this Sentinel median and the boring lawn grass median a few dozen feet away at the intersection of Crescent and Sentinel. In the last newsletter which announced that our new DMNA President is Bob Hague, we should have mentioned that we also have a new vice president. When Jeff Glazer resigned the presidency due to moving out of the neighborhood, Vice President Bob Hague automatically became president. The Council then elected a new Vice President. The new Vice President is JoAnn Kelley. Both Bob and JoAnn live in the Crawford part of the neighborhood which is west of Whenona Drive. The article about the need for additional Council members and representatives to the Allied Wellness Coop and the Allied Task Force brought a couple of inquiries. There may soon be some new faces in the neighborhood leadership. Treat yourself to appreciation of the Arboretum in the form of a multi-media exhibit at the Arboretum Visitor Center all this month and next. Photos, drawings, paintings, quilts, physical journals, and more will help you appreciate this world-class nature sanctuary even more than you do now. This display was produced by the Arboretum Corps of Discovery, a group of about 40 local people who participated in a 4-day training back in October and November 2009 and then documented a host of wondrous things they saw in the Arboretum over the past year and a half. The Corps of Discovery is modeled on the work of the Lewis and Clark Expedition. which took place from 1804-1806. From a physical journal - an actual collection of twigs and nuts - and small poster you can learn how to tell what animal has browsed on these items in nature’s pantry. Other large posters document the different ferns in the Arboretum and introduce some of the ephemerals - flowers that bloom and then disappear. Other posters demonstrate the skills Corps members were taught and show that any person can learn to better communicate nature through words, drawing, photography, and other methods. A definite favorite will be the rocking chair that was painted to resemble a pond and a tree. A model duck sits on the pond (the seat), a bird crawls up a painted tree trunk (the back of the rocker), and another model bird perches on the top of the chair. This writer has several works in the show including 4 photos of the “duck pond” on Nakoma Road during the 4 different seasons. The Visitor Center, accessible from Seminole Highway just across the Beltline and down the hill, is open weekdays from 9:30 a.m. – 4 p.m. and weekends from 12:30 to 4 p.m. (excluding holidays). As you know, the governor signed the concealed carry bill into law today. Because of the interest this bill has generated, I am sending out a special edition of my e-newsletter with details about the bill. As you also know, I have been and continue to be opposed to concealed recently. The argument that the constitution guarantees this right is to me, specious. Taken from a letter in the Milwaukee Journal Sentinel: “The framers of our constitution had no concept of the technology we would have today. In the 1790s, a muzzle-loaded rifle weighed 10 lbs., was 60 inches long, and even the most proficient marksman could fire only two to three shots in one minute.” Contrast that with the weapon used by Jared Lee Loughner to shoot Congresswoman Gabrielle Giffords, which could fire at least 30 rounds in 10 seconds. I am also not swayed by the opposition saying that concealed carry is in effect in 48 other states and there has been no noticeable increase in gun violence. The firearm homicide rate in the United States is almost 20 times higher than in 22 other populous, high-income countries that have similar crime and violence rates. When the Assembly was debating the concealed carry bill, I spoke about my concerns that allowing concealed weapons would increase the danger for individuals in violent domestic relationships. (You can watch my floor speech here.) Several of my colleagues raised other inconsistencies and problems with the bill. Unfortunately, concealed carry supporters did not address those concerns before they passed the bill. I know that the majority of my district does not wanted concealed weapons, but that there is a small percentage that does. In either case, I think you will be interested in the details of the bill. Now that concealed carry will be law in Wisconsin, the primary questions from many of my constituents are logistical in nature. Where can people carry concealed weapons? Where are concealed weapons not allowed? Are there any people who may not obtain concealed carry licenses? How can I stop people from carrying concealed weapons on my property? Q1. What types of weapons may be concealed? Q2. Where are concealed weapons specifically prohibited? Q3. Where are concealed weapons specifically allowed? Q4. Where may concealed weapons be prohibited voluntarily? A special event is one that is open to the public, for a duration of not more than three weeks, and has designated entrances. Q5. What does "residence" mean exactly? · For single-family residences: it does include the residence building itself and the parcel of land on which the building is located. · For multi-family residence: it does include individual apartment units, but does not include common areas of the residence building or of the parcel of land on which the building is located. Examples of common areas include: entryways, shared laundry facilities, pool areas, etc. Q6. What are the posting and notification requirements necessary to prohibit concealed weapons? · If posting is required, signs that measure at least five inches by seven inches must be used to notify people that concealed weapons are not allowed on the premises. · Signs must be located in prominent parts of the building to which the restriction applies. · Signs must be posted in prominent places near all probable access points to the area in which concealed carry is restricted. · You may specify that you don't want certain types of weapons to be concealed, but that other types of weapons are acceptable to conceal. Q7. Can I carry a concealed weapon at work? · Exception: if your employer states in your employee handbook that concealed weapons are not allowed on work property. · If you do not have a license to carry a concealed weapon, then the answer is "no." Q8. What is required for me to get a concealed carry license? · You must be a minimum of 21 years old. · You must not be prohibited under federal or state law from possessing a firearm. · You must not be prohibited by a court from possessing a dangerous weapon as a condition of bail or parole. · You must provide proof of approved training. **The law is not clear how one qualifies as a Wisconsin resident for the purpose of obtaining a concealed carry license. The word "resident" means different things in different parts of the law. Since SB 93 did not define the word "resident," this may result in confusion. Q9. What constitutes adequate training for a concealed carry license? · No matter the type of training an individual receives, completion of training must be proven by a copy of a document indicating that the training was completed or by a sworn affidavit from the instructor who performed the training. · The bill explicitly bans mandatory “hands-on” training with firearms. Q10. Will my Wisconsin concealed carry license be honored in other states? We don't know yet. While Wisconsin will have a "licensing system," the training required to obtain a concealed carry license in Wisconsin is not nearly as rigorous as the training required in many other states. So, it is likely that Wisconsin's concealed carry licenses will not be honored in most other states. But, this hasn't yet been tested, so we don't know either way. Q11. Will my concealed carry license from another state be honored in Wisconsin? Probably yes. DOJ will create a list of states whose concealed carry licenses will be honored in Wisconsin. Because Wisconsin's concealed carry license requirements are much less rigorous than other states, it is likely that most other states will be on this list. If you possess a valid concealed carry license from a state on the DOJ list, you are considered a concealed carry licensee in Wisconsin. If you have more specific questions about Wisconsin's new concealed carry law, feel free to contact me or contact the Department of Justice for additional information. It doesn’t take much time for someone to take advantage of new laws. This morning I noticed a sign at the Verona Road entrance to our neighborhood. It was an advertisement for a concealed carry class for women along with a phone number. Personally, I don’t think it is all that safe for people to be armed to the teeth, and I don’t relish the idea of wondering if people strolling the neighborhood might have pistols in their pockets whether they are women or men. Maybe this sign in our neighborhood just indicates that someone wants to make a quick buck from our new law, but I can’t help but think that it also makes it seem like we live in such a dangerous world that we should be willing to shoot to maim or kill at any moment. I don’t want my neighborhood to be a war zone. For me it’s more than enough to read and see the daily news about wars in other places. I want my home to both feel and be safe.